Local Author Sylvia Shults was the guest speaker Friday evening at the Tazewell County Museum's Annual membership meeting at the Pekin Public Library. Shults gave a riveting presentation on her book "Fractured Spirits" which is about the Peoria State Hospital located in Bartonville, IL. The Hospital closed in 1973. Shults who has written 11 books throughout her career, writes mostly about ghost. Shults told the audience that as a child she could not get enough of ghost stories. As she was writing her book "Ghost of the Illinois River", she kept hearing from people about ghost stories from the Peoria State Hospital, so she decided to check it out. During her writing of the book, Shults talked with relatives of past patients, nurses, and paranormal investigators in writing this book. Shults calls the Hospital a "Perfect Storm" for it to be haunted. Physical property, limestone, running water. Historical: Native American presence. Patients belongings still there, and a care of patients. Right: Shults new book "Fractured Spirits"
After giving her presentation, Shults took questions from the audience and signed books. Museum Director Christal Dagit then gave an overview of the Museum's goals and financial picture. Left: Author Sylvia Shults talks with audience members and signs her book. Local author Sylvia Shultz will give a program on her new book, "Fractured Spirits" at the Tazewell County Museum's annual membership meeting, on Thursday, March 27, at 6 p.m. at the Pekin Public Library. The public is invited. Sylvia has been writing books for years now. She started off writing fiction (horror and romance), but I she was always fascinated with true ghosts stories. She said that she loved them as a child, and still does. Several years ago a publisher contacted her and ask if she would like to write a collection of true ghost stories called "Ghost of the Illinois River". It was during the writing of that project that she learned about the Peoria State Hospital, and the many paranormal experiences people have had there. Left: Cover of Sylvia's new book, "Fractured Spirits"
She told me that's when she started doing more research into the history and hauntings at the Peoria State Hospital. At first, I was just enthralled with the idea their being such a haunted place so close to my home. Then, I delved deeper into the history of the asylum. The stories I found, of life at the Peoria State Hospital, were just as fascinating as the ghost stories. I was intensely grateful to discover such a legacy of caring and compassion, the legacy of most of the asylum's history. The Peoria State Hospital was the premier mental health facility of its day. Dr. George Zeller instituted the eight-hour workday for his staff, removed patient restraints, and made the asylum into a model for the care of the mentally ill.
Amazon says that," Sylvia brings a passion for paranormal investigation to her adventures at this haunted hotspot. The spirits come to life once more as Shultz explores their former home. Other voices help her tell the story: this is a collection of people's experiences at the Peoria State Hospital. Ghost hunting groups, sensitives, former nurses, and ordinary people share their stories with us, their voices resonating to create a panoramic view to rival the vista of the Illinois River". Sylvia also works as a librarian, mostly in order to feed her book addiction. She also serves as the Publicity Director for Dark Continents Publishing. 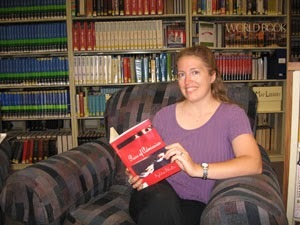 In addition to nonfiction, Sylvia also writes romance and horror. Sylvia lives with her husband, 2 dogs and 3 cats. Please come out and listen to Sylvia share her story, and stories from her new book, (Fractured Spirits). Please visit www.facebook.com/FracturedSpirits for an interactive experience. listen to EVPs, watch videos, and share your own ghost stories about the Peoria State Hospital. Once again, the program is at the Pekin Public Library, Thursday, March 27, at 6 p.m. The public is invited.